Summer wreaths are the perfect inspiration for bringing in warm vibes and gorgeous colors! To make a summer wreath you just need to think about all things summer can offer and of its colors. To me, summer is about beaches and the sea, but also about the abundance of delicious, fresh summer fruits. So just go ahead and make a gorgeous fruit arrangements wreath for example to welcome the perhaps best season of the year. The steps are easy to follow and the supplies needed are basic. Bring summer to your front door! You can find the link to the video to the fruit arrangements wreath tutorial here. Start by cutting the greenery and flower stems, leaving 4-5 inches of stem, so you can use it to stick the greenery and flowers into the wreath. Pock a hole into each lemon. Be careful not to poke all the way through the other side of the lemon. You can add a drop of hot glue to the point where the pick enters the lemon, to secure. Lay the wreath form on your work surface and start arranging your items loosely so you can find the arrangement you like. Make sure to not forget the ribbon for hanging. You will have to tie the ribbon around the wreath and make a loop for hanging before making anything else. When you are happy with how your wreath looks, insert the greenery into the wreath. You can use hot glue if needed. Next, insert the lemons, adding hot glue if necessary. 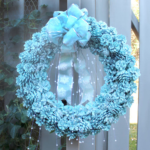 You can use other types of wreath forms as well, like foam wreath forms. Just make sure to fill in any gaps with some greenery so they don’t show. Also, think about using fresh lemons, greenery and flowers instead of artificial ones. This will make your wreath having a wonderful fragrance, although its life span will be significantly shorter. For more fun summer wreath ideas, think about embellishing a wreath form with summery items, like colorful mini paper umbrellas, fake sunflowers, seashells and nautical themed items. 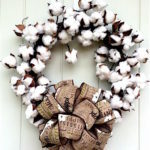 If you don’t know how to make a wreath and never dared to make one, start out with an easy project. Get a pre-made wreath and just decorate it with whatever you want and that you think will make it look worth hanging on your door. Wreath inspiration turns into a centerpiece! Find the link to fruit centerpiece idea here. 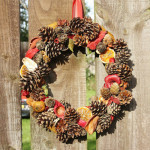 So you can see making a wreath does not always mean you have to hang it on your door. 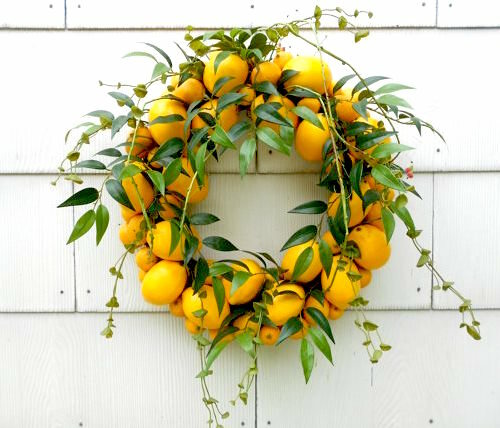 Instead use the wonderful fruit arrangements wreath to decorate your outdoor or indoor table, or hang it on your kitchen wall. Such a wreath will never go unnoticed and whether you are using fresh or artificial items, it will simply look gorgeous with its vibrant colors. For more fruit wreath tutorials look at this dried fruit wreath idea! This is SO gorgeous! I wish I had this talent. I love this! It’s perfect for summer! Thanks for partying with us at the Wake Up Wednesday link party! Hope to see you again next week! I love the idea of making a summer wrest. Great post! This wreath is so pretty!! It looks so perfect for summer – I think I’ll be making one soon! 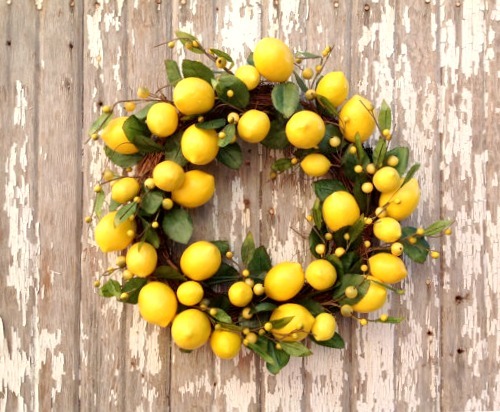 I love lemons and this wreath is so pretty. Thanks for sharing it. Your wreaths are always so pretty! Great job. Visiting from Merry Monday. This would really brighten up an entrance – very pretty! This is lovely and perfect for summer!